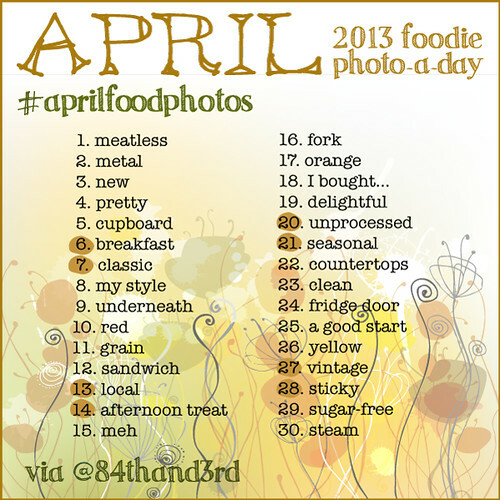 April Photo Challenge 2013 #aprilfoodphotos: The Foodie Photo-A-Day! 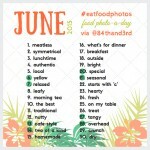 Welcome to the April 2013 Foodie Photo-A-Day Challenge! Thanks to everyone who has joined us over the past few months, I get such a kick out of seeing all the photos and interpretations of the prompts. While the usual suspects – seasonal, meatless and a few others – are still on the list I’ve got some interesting new ones too this month. I’ll be playing along on Instagram, Twitter and Tumblr, and I’ve also joined Vine recently too – as ’84thand3rd’, of course – so a video may show up here or there – pop by and say hello! 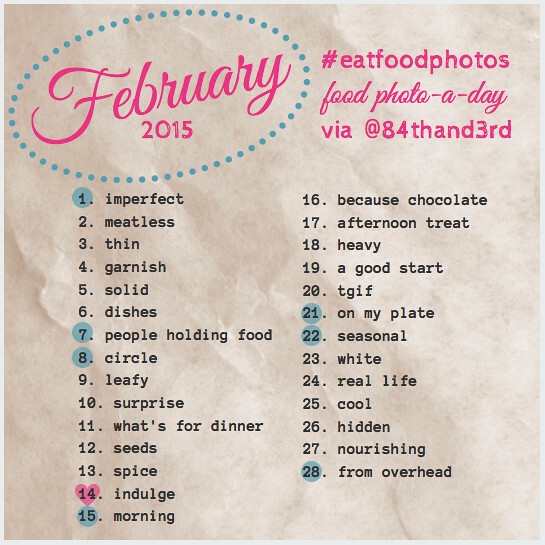 Take a food inspired photo each day of April that corresponds to the date and prompt in the list above. Feel free to interpret the prompts any way you’d like! 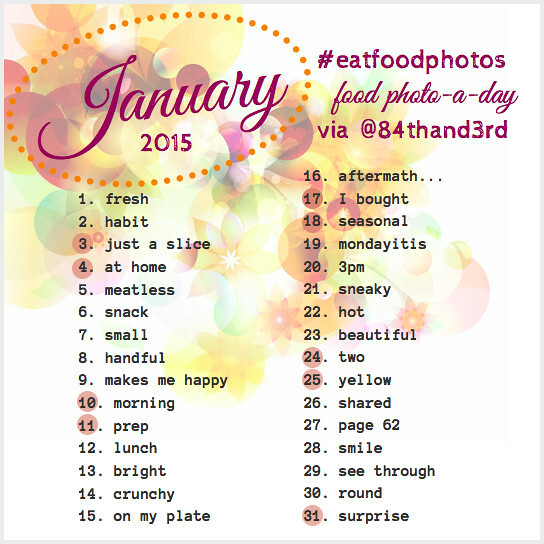 Once your photo is taken, use the hashtag #AprilFoodPhotos to post and share wherever you’d like including Instagram, Facebook, Twitter, Flickr, Pinterest, Tumblr, Eyeem, G+, Vine or your blog. 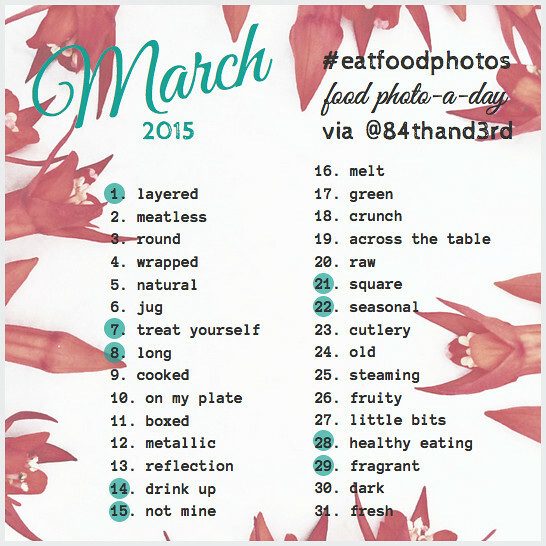 Let me know in the comments where you’ll be playing along for #AprilFoodPhotos! Thanks for this JJ. I am going to try really hard to participate this month ???? It’s a great way to brush up my woeful camera skills. I am going to play on either twitter or Facebook (or both). Just saw this! So glad. Now I can join and not be in trouble for posting lots of foodie photos!!! Just found this today so I missed April 1. I will be playing on instagram and maybe fb.